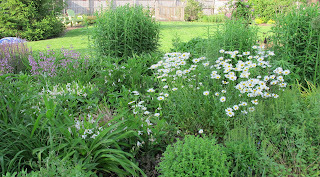 Welcome to Garden Bloggers' Bloom Day for May 2012. 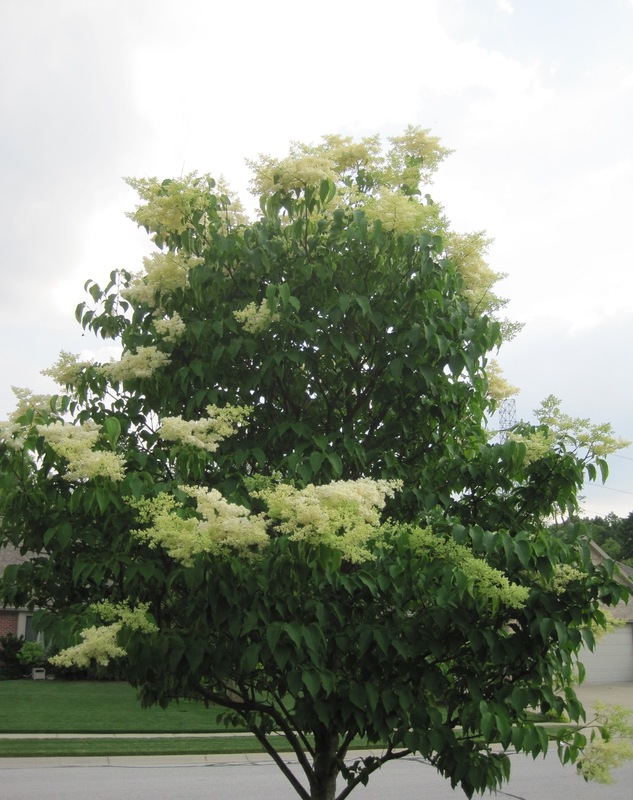 Here in my USDA Hardiness Zone 6a garden in central Indiana, we are seeing blooms in mid-May that we don't normally see until early June, including those of the Japanese tree lilac, Syringa reticulata 'Ivory Silk'. This is good because the other lilacs in the garden which would normally bloom in time to cut a big bouquet of them for Mother's Day bloomed out several weeks ago. At the base of the tree, an unnamed passalong sedum ground cover is also in full bloom. I'm usually quick to cut these blooms back when they are still buds to neaten up the garden, but I haven't gotten around to it. In full bloom, they are a magnet for gigantic, slow-moving, loudly buzzing bumble bees, so I'm leaving them for awhile. 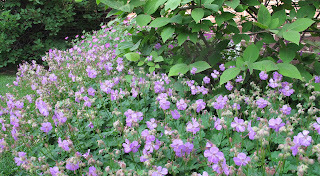 Elsewhere in the garden, there is a nice flush of blooms on the geraniums. I apologize for not knowing which one this is, but I find that as I continue to garden, I'm less interested in knowing the exact names of some flowers. "True Geranium" will have to be good enough for now. I do know the name of this clematis and can almost hear them "ring" throughout the garden. And this is Clematis integrifolia 'Alba'. I just let it creep along through the Ploppers' Field, my border of plants that are just plopped in wherever there is room for another plant In the background Salvia and Penstemon have been blooming for a good while. Elsewhere in the garden, roses, false indigo, more Salvia, Penstemon, Amsonia, garden peas, and columbine have been blooming for several weeks, including, finally, my long coveted yellow columbine. I've wanted yellow columbine for years so was happy to see these in my garden this spring. Finally, I've decided each bloom day that I should stand in the same spot to show a long view of a garden border so I can see how it changes each month. I chose a spot that shows most of Ploppers' Field. It doesn't look like much right now, but just wait until the daylilies in there start to bloom. Happy GBBD to everyone. I have blooming orchids and butterflies. Your garden is lovely, as it is on every Bloom Day. As always, thanks for hosting us and happy Bloom Day. I really like the idea of letting clematis vine along the ground of the garden. I never thought about that...great idea that I may try. Thanks for hosting! What a lovely display of flowers you have! And some are so early! Quite the opposite to here in London where I live – this year is the latest I can remember, thanks to the cold and rainy weather we have had the last 5-6 weeks. And what a magnificent Syringa reticulata you have, wish I had room for a tree like that in my tiny garden :-) Thanks for hosting the Garden Bloggers’ Bloom Day! 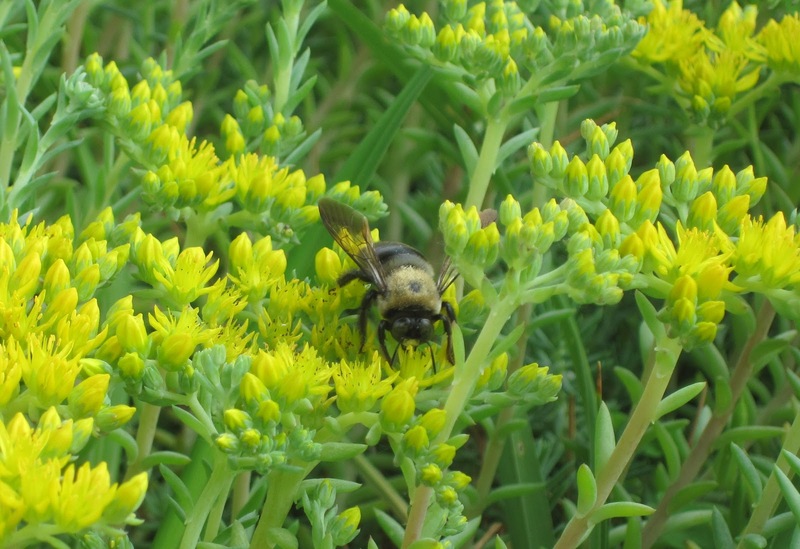 I'm with the bumblebees - very happy you didn't get a chance to trim your sedum. I love the zing of citrus-y yellow. Your Plopper's Field is gorgeous, and what a fun name! And yay giving some food to the big old bumbles. They are wondeful too. Some plants were early this year, and others late. Odd spring. A beautiful bloom day to you, and thanks for hosting it. It's interesting to see your garden continuing along on fast forward. A Syringa for Mother's Day sound slike a nice bonus. Happy Bloomday! Great blooms - and I'm so with you, the exact names don't always matter that much. Like the long view - maybe you want to join me for First Views on the first of each month? It's a mini-meme compared to GBBD, but I've been finding it quite educational. Love the clematis and yellow columbines, Carol! 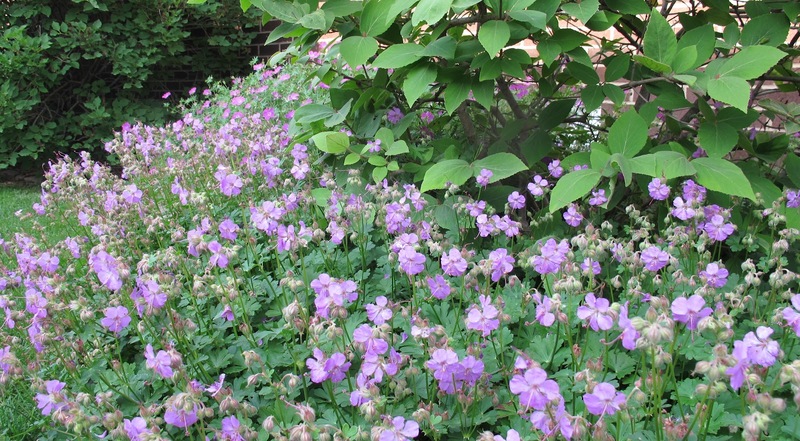 I think your NOID geranium might be Geranium cantabrigiense 'Carmina.' We have the very pale pink Geranium cantabrigiense 'Biokovo.' I love the scent of the foliage. Whatever it is, it's pretty! Your gardens are especially lovely this spring with all those purples and yellows and looking so full already! Thank you for hosting and a Happy GBBD to you! Good morning Carol and I loved seeing your wide angle view of the 'field' and it certainly looks as if you've got a huge growth spurt with your plants. Quite the opposite here and plants that featured in 2011 GBBD haven't even started to flower here. I've got Fothergilla ' Blue Shadow in flower along with lots of blue flowers that has given my garden a bit of a blue mist. Happy bloom day. Your garden is looking great. That clematis looks awesome. And I agree, the yellow columbines are one to covet, my favorite columbine even ahead of the California native one. Thanks for hosting. 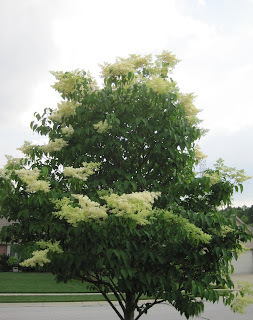 Your garden is lovely in May, especially that Japanese tree lilac. I can see how the month named your blog. Our spring came early in Maine too, although for us that means it only just started. Happy Garden Bloggers Bloom Day! How I wish I have those dainty flowers in my garden! Your garden is looking lovely Carol. I too like the idea of letting a clematis scramble along the ground. I have them through shrubs that act as a good green backdrop. Thanks for hosting another Bloom Day. You're obviously early this year while we're late here in the UK. I think your unidentified geranium is Geranium macrorrhizum. What a good idea to show Ploppers long view each month. It will be interesting to see what goes on. I will have to check to see what is blooming in my garden today. Happy GBBD. Happy GBBD to all. It's raining this morning here in upstate NY and I have to post a little early today due to my schedule. Our "earlier than normal" blooming continues. You had some nice purple notes. One overall comment to all my gardening friends: Our lilacs were terrible this year and I understand from a friend in NYC that theirs were also - did anyone else have a "lilac fail" this year? Have a fantastic time in Asheville this weekend. I'll be thinking of you all and say hello to everyone from me. I'm at Chelsea Flower Show with Victoria on Sunday and Monday, so we're in for a garden treat as well as you guys! thanks for hosting as always. May dreams. Everything's early and different here this year, too. Thanks for hosting, Carol! Beautiful blooms this dreamy May in May Dreams Gardens, Carol. I believe that you have 'the Duchess of Albany ' clematis. 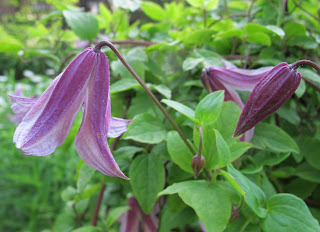 My daughter has a blue bell-shaped clematis 'rouguchi' that blooms all summer. Look forward to seeing you in N.C. this week. Love those two Clematises (what is the plural of Clematis?!). Must get me more of these. Always inspiring to see others' gardens, especially those growing the same things, but whose plants are a few weeks ahead. What you've got now, we will enjoy in Nova Scotia in the weeks ahead. Thanks. PS I meant Tree lilac and I love the bee! I had to chuckle at your comment about "...the more I garden, the less concerned I am with knowing the exact name of a plant..." as I have several unknowns featured today, too. I do love your Pagoda clematis! Thanks for hosting bloom day, Carol - it's always an adventure! I'm so happy that I finally have blooms to show off for GBBD! Although we had a mild winter around DC, it feels like spring took a while to get here. Thanks, Carol, for hosting this fun event! I have meant to participate in GBBD for years. I finally got organized in time this month and am so excited to be here in and among all these wonderful gardens and gardeners. Thank you so much for hosting this event! Happy Bloom day Carol. Love your pretty little clematis Pagoda. So like our native one. Happy GBBD! I love the yellow columbine. Trying to grow that here too. Featuring a wildflower known as Mexican Hat for my GBBD post. I really look forward to Garden Blogger's Bloom Day - thanks for this great idea. Your garden looks lovely - my favourites were your yellow columbine and the Clematis 'Pagoda'. My wisteria decided to live and to bloom. Woohoo! Carol, I love your idea of standing in one spot for every bloom day. I'm not sure my post really qualifies for GBBD because I got stuck on a particularly euphor(b)ic genus... But I can't not participate. Thanks as always! Sometimes I think my whole garden is Ploppers' Field. :) Yours is lovely! 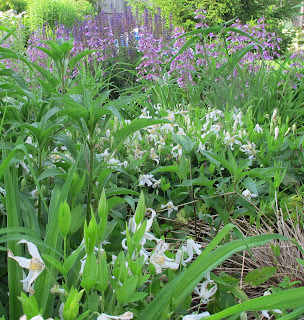 the border looks soft and lovely even without the spectacular daylilies. Thanks for hosting GBBD! It gave me a good excuse to slip out to my garden first thing this morning. My lilacs have just begun to blossom. I love walking outside and smelling their sweet scent. I think I'll steal your idea and cut some to bring indoors. Happy Bloom Day! I love the name "Plopper's Field" and how you let that beautiful clematis creep about. Bloom Day Greetings from the 9th zone.. I think your spring garden looks fantastic - and that area will just get lovlier when the daylilies come in. Love that clematis. I like your idea of a long shot each Bloom Day: I'm going to adopt it for a particular view of the garden at Longview Ranch. This month I have a few continuing shrubs, the first roses, and an eclectic assortment of new bloomers. Thank you for hosting, Carol! Really like your yellow Columbine! I will try to visit some of these wonderful gardens today. It may take a week though. Thanks, Carol. It is YOUR month. Great photos! And there is no shame in not knowing the name of a plant, especially when it spreads gently through the garden so you don't have to buy any more of it! I love how you have the clematis growing along the ground, and your idea of taking a picture of the same spot every month will be so interesting! Thanks for hosting! Cheerful blooms despite the rainy weather. Great Idea, standing in the same spot each Bloom Day for a broad view of the garden. Everybody should include a broad view -- I had one and took it out because my post was already too long but there are short views in most of my pics, not just down the throat of a lily. Thanks for hosting once again. I love the yellow Columbine. I planted a native western Columbine earlier this year. Bought it @NWFGS as a bareroot. It's up, but not a bloom in sight. Maybe later in the season; maybe next year. My pink and purple ones will have to suffice for now. Most excellent idea to include an over all shot in the mix. We (I) get so focused on the up-close flower shots the big picture is lost! I'm considering the Ivory Silk, or another Tree Lilac, China Snow. Does Ivory Silk get big enough to put a table and chairs under for shade? I don't want a big tree, but I do want shade. Love your May blooms. Its definitely the best time of the year with new blooms each day. I like that idea of documenting your garden's progress from a single vantage point...& your plopper's field could pass for a designer's handiwork. Your garden is wonderful. Thanks for hosting GBBD! I have a Ploppers Field too. Sadly, it's my front foundation bed and doesn't look half as good as yours! Happy GBBD, Carol! Your Ploppers' Field is so inspiring. It makes me want to get rid of all the lawn! 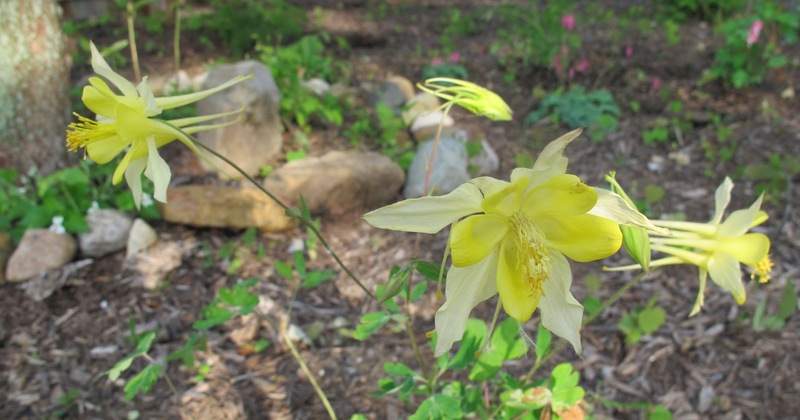 The yellow columbine is a favorite in my garden. It bloomed long ago here in Austin, but there are a couple rogue blooms I noticed this week. We've had a nice spring, I guess they're responding in kind. I adore the 'Pagoda'--so beautiful! I also love the idea of photographing a long shot of the garden each month to track the blooms--I may need to borrow that idea! Thank you so much for hosting Bloom Day--it's such a good reminder to stop working in the garden for a few minutes and take some time to enjoy the blooms! Cheers! really love your yellow columbines! I need to get some of those! Thanks for hosting GBBD - it's always fun and interesting to see what's blooming in everybody's garden across the land. Love "Ploppers Field" - every gardening needs one of those! Over here in Europe, in many gardens nature is a little bit 'behind', so we now have flowers we normally expect to see towards the end of April. I love the shot of Clematis 'Pagoda.' I'm growing a clematis and letting it sprawl throughout a bed too. This is my first time in trying it. I love the idea of you standing in the same place in your garden and taking a photo to see how it changes. Coincidentally, in my GBBD post today, I did something very similar to illustrate how quickly gardens change. We must have been thinking about the same things! Thanks for hosting, your garden looks beautiful! Thank you for sharing your garden and for hosting GBBD. As always it is such fun to see what is blooming around the nation and around the world. Happy Gardening! So many beautiful blooms, back home again in Indiana. I love your clematises and the little bee on the sedums. Happy Garden Bloggers Bloom Day. I love your idea of taking a shot from one spot each month--gotta remember to do that. I love your yellow columbine - I have just germinated seeds for some so should hopefully have a chorus of long-spurred yellow next year too. I love the month-to-month shots so you can see how everything progresses. Beautiful stuff, as always! Thanks for hosting! Beautiful pics!! I wish I had more to show this month. :( Hopefully next month I'll actually have time to put something new in the ground! hellooooooo there! looking forward to seeing you in asheville carol! happy gbbd to all. Both clematis varieties look great, but that Pagoda is especially lovely. Definitely see where the name came from. Taking a photo from the same spot each month is a wonderful idea; I may start adopting that for GBBD! I remembered Bloom Day! I'm afraid my offering is just a tiny one, though. Your garden, OTOH, looks absolutely smashing. Can't wait to see you in a couple of days, Carol! I enlarged the photo of your plopper's field, and found lots to see. I love it! I looked up that white clematis. That may be what I have that I thought was going to be Fremont's clematis. I do like that bloom. I am normally one of the first 20 or so to link in. I didn't get my post finished until just now, and see that I'm 134. Wow, what a lot of GBBD posts! It is rare that we venture out to look about WordPress, but are very happy to have come across your own 'site'. Although spending very little time on the Internet, we are interested to see how a garden looks in your part of the world. I have the same sedum and use it as a green mulch. Thanks for another Garden Blogger's Bloom Day. I'm late, I'm Late, I'm late for a very important date! There are still a few hours left in GBBD. Thanks to Carol for hosting. Wonderful clems, Pagoda and the white integrifolia. It will be a great series to see Plopper's Field run through its seasons -- what a good idea. Clematis 'Pagoda' is lovely. I think I need it. Ploppers field - I love that term! thanks once again so mcuh for organizing this display of blooms around the world - I have added my link. Thank you so much for hosting. I love yellow columbine. Mine bloom around Mother's Day every year. My yellow columbines have yet to bloom and I'm concerned they're sitting this year out! 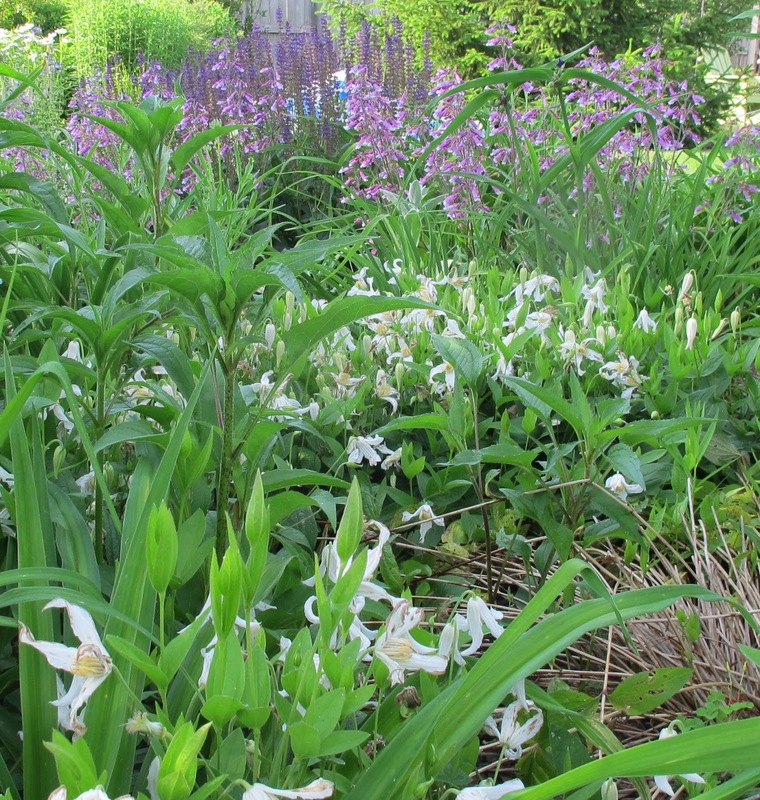 "Ploppers Field" is lovely, with or without the day lilies. Happy GBBD! Carol, I'm interested to see that your garden is still weeks ahead of schedule. In my Gettysburg garden, cool temperatures in April and early May have slowed things down so that I have just about exactly the same blooms that I had this year at this time. I love Clematis integrifolia 'Alba'... will look that one up. Your unnamed Sedum is S. 'Acre'. We have covered our curb strips with it after killing off the turf. It makes a wonderful lawn replacement plant. Loving that long shot -- more please! Go Pacers - great game tonight - good to see them give it to the Heat. I'm to tired to stay up for the rest of the Spurs game and too busy working & getting ready for Asheville to use my tix. So sad. Looking forward to seeing you on Thursday! Happy GBBD. Oh man today got away from me, work just gets in the way! Had my pictures of so much blooming this month, almost more than I could list! Everyone's gardens looks so good. Next month! This is so impressive! It's my first time participating in bloom day, and I too almost forgot. It popped up as an Outlook reminder at 10:45 pm. Good thing I had been snapping photos between Sunday and today. It's nice to take part in what I hope to make a monthly ritual. I didn't read through all the comments as I'm short on time, but the unknown Geranium is possibly 'Biokovo Karmina'. If so it should have strongly fragrant foliage. Gardens look great! Stepped out of the kitchen garden to capture some ornamentals this time a round. Fruit trees have dropped petals, strawberries are just making buds, and veggies are too young to blossom. Still, the yard is going gangbusters this year! I love the soft colors of your Spring garden! Thank you for hosting this fun day in May! Carol, as always, thank you so much for hosting Bloom Day. I enjoy looking at everyone's flowers, and it has given me such great ideas for my own garden. The yellow columbines that I have been patiently waiting for have finally arrived in my garden, too! I love your idea of ploppers field- it's just a great idea, and a great name. I think your "Plopper's Field" looks beautiful already! Thanks for hosting GBBD - such a great garden meme. Now off to check out everyone's blooms! I love 'ploppers field'...I have a couple of those myself;-) I'm 'late' again, as usual! This is how I roll these days. Thanks for hosting! Lovely blooms you have there! Thanks for hosting! Thank you for hosting. See you soon. I enjoyed your bee photo. I'm not sure why, but I love taking pics of the bees. The pagoda columbine are beautiful. I have not seen those before. I will try to catch bloom day next next month. It is a pleasure to browse through beautiful gardens all over the country. Thank you for keeping the garden gate open! Carol, your Clematis "bells" are delightful. I have one that makes tiny pale blue bells, but not for a while. I love your yellow Columbines, so cheery. I have some Columbines blooming now, they are uniquely airy. Happy May, the month of dreams! Thanks for hosting this wonderful event each month. I'm late to the party, as usual, but I love looking at your (and everyone else's) blooms. Late to the party, as usual, but happy to be back to blogging after a long winter away. Everyone has such lovely pictures to share! Better late than never, I guess. I like Garden Blogger's Bloom Day so much that I just couldn't miss it entirely. Every month I like looking at people's posts, dreaming what I should add to my own garden for next year... Thanks for hosting! Hi, Carol, and here I am again, bringing up the rear (better late than never). With a mild winter and early spring, we have so much blooming, but too little time to blog since the rain is feeding the weeds! Still, we didn't want to miss your monthly bloomfest! All photos are as of May 15th, although it took me a while to put it all together. Happy GBBD to all! I'm usually one of the last to post each GBBD and I try to go back and view as many of your posts as possible. Enjoy the weekend!